Does the Appian Way Go Upward From Here? Let's see where the technicals lead us on this lesser-known cloud stock. In his second "Executive Decision" segment of Mad Money Thursday night on CNBC, Jim Cramer sat down with Matt Calkins, founder, chairman and CEO of Appian Corp. (APPN) . APPN is an application software company for business. The shares are up about 116% since their May 2017 IPO. Calkins explained that Appian's platform allows companies to build applications in a faster and more elegant way. With Appian, customers can build their apps in weeks, instead of months, Calkins added. Has the government shutdown affected their business? Calkins said there are some contracts which are being delayed, but he doesn't see that business going away. Cramer said APPN is a lesser-known cloud stock, but is worth a spot in your portfolio. Let's check out the charts and indicators before committing. In the daily bar chart of AAPN, below, we can see a mixed picture. In the short run or near term APPN looks like it can extend its December-January rally. Stepping back from the chart and seeing the past year gives me the opinion that APPN will continue its longer-term sideways price action. APPN is above the rising 50-day moving average line and the bottoming 200-day moving average line. The daily volume picture the past three months as APPN started to strengthen on the chart is unimpressive. I like to see volume increase during uptrends and that is not yet happening. The daily On-Balance-Volume (OBV) line has not broken above its November zenith but prices have broken out. This is a small divergence but a divergence nevertheless. The daily Moving Average Convergence Divergence (MACD) oscillator is above the zero line for an outright go long signal but the MACD oscillator the past year has basically been "hugging" the zero line and not showing much trend strength. In the weekly bar chart of APPN, below, we can see the price action since the IPO. Prices are just now back above the slightly rising 40-week moving average line. The weekly OBV line has been in a downtrend the past year but December the line makes a higher low. A break above the November high of this line would be constructive, should it happen. The weekly MACD oscillator has crossed to a cover shorts buy signal. 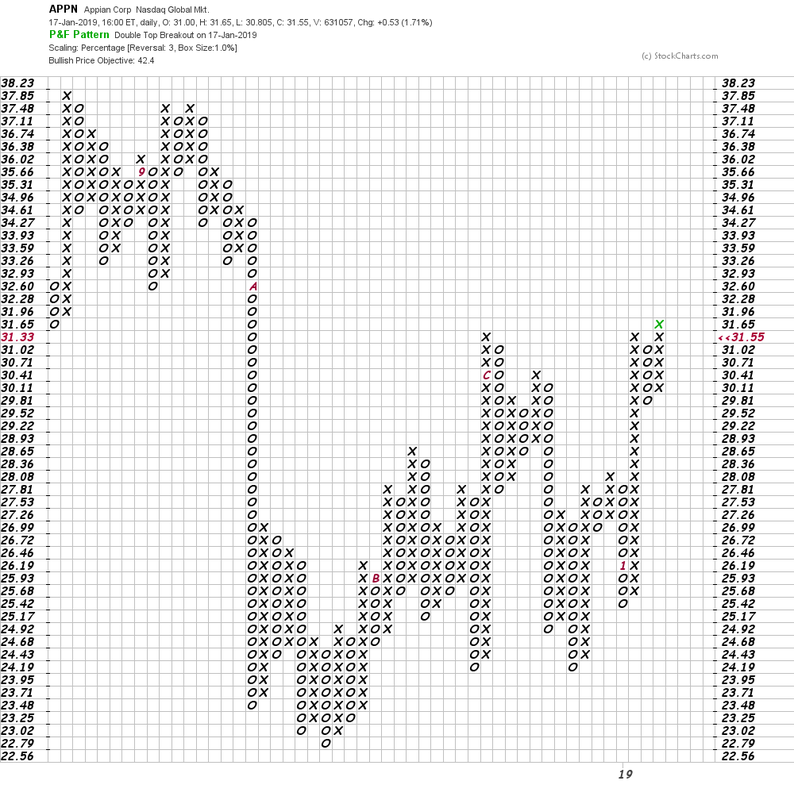 In this Point and Figure chart of APPN, below, we can see a recent upside breakout at $31.65 and an upside price target of $42.40. Bottom-line strategy: I think Jim Cramer has a great eye for spotting new ideas and new companies. APPN may well be a great addition to one's portfolio but I would like to see more price action, which would include a stronger OBV line on the daily and the weekly chart. Let's put APPN on our shopping list and visit with the charts again.